It’s been almost a week but I still can feel the warmth and love gathered at The Garden Slug last Sunday, 29 November, as all the cat lovers gather together for a lovely afternoon of fundraising event. The inaugural pop-up cat cafe was organised by Love Kuching Project and its core operations focuses on cat rescue, sterilisation, cat adoption and educating the general public. 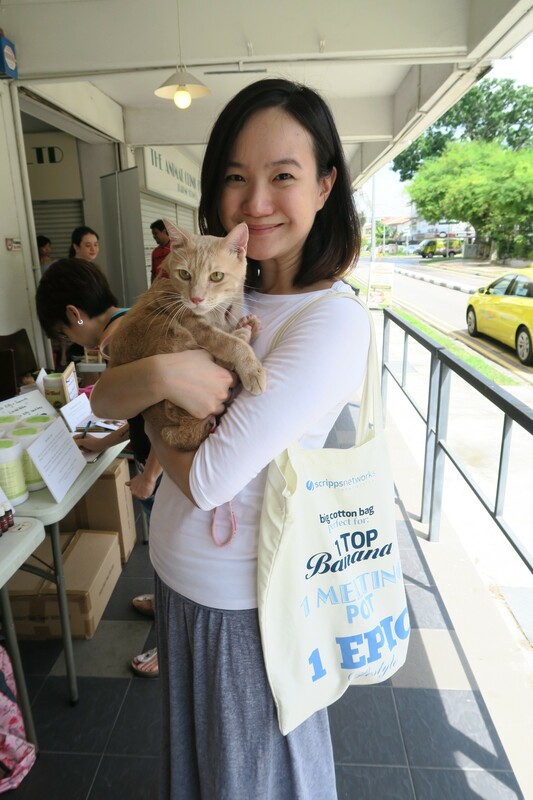 Helping out with the publicity of the event and also personally, a huge cat lover and volunteer, is none other than familiar face, Nicole Seah. Despite her departure from the local political scene, she has continued to help out in the initiatives discovered during her walkabout back in GE2011 days. We caught up with this affable young lady at the pop-up cat cafe. Asia 361: How did the idea of a pop-up cat cafe come about? Nicole: The founders began this cattery in 2009 and started operations from their own home. Gradually, the number of rescue cats got too big and we had to move out into a proper space. In 2013, we moved to Joo Chiat, the current cattery operations ground and rental is a hefty sum every month. Therefore, we decided to hold a fundraiser, hoping to gain exposure and financial aid from the public. Asia 361: Why is the event held at The Garden Slug cafe? Nicole: The owners of this cafe support a lot of social awareness event and we thought it would be ideal to partner with them for this event. Nicole with one of her four cats, Peanuts. Asia 361: Just a personal question, are you a cat or dog person? Or maybe both? Nicole: Definitely more of a cat person. I personally own four cats myself and Peanuts is down with me today for the event. I’ve been taking care of them since I was 16 years old, so the connection and bond is definitely strong with these little felines. Asia 361: What is the biggest problem the cattery is facing right now? Nicole: The financial aspect, as we need to pay large sums of medical bill to treat our injured or rescued cats, as well as to continue running the operation. Secondly, it would be good to have a steady stream of volunteers to help the cattery on a regular basis too. Asia 361: If you could only give out one piece of advice, what would it be? Nicole: If you are interested in getting a cat, try to adopt cats instead of buying them from pet store. Also, older cats are easier to train and they are actually pretty low maintenance and easier to take care of, as compared to kittens. Asia 361: Are there plans to hold a second pop-up cafe? Nicole: Honestly, there isn’t one initially. We were unsure of the turnout and how things would work out. However, based on today’s event, we are proud to say that it was quite successful with a steady stream of people coming in throughout the day. Here are some photos taken during the event if you have missed it. We look forward to the next event. Till then, meow away and feel free to contact the organisation at email: elaine@lovekuchingproject.org should you want to help in any way. The post Conversations with Nicole Seah: Love Kuching Project appeared first on Asia 361.